NO ONE WANTS TO LOOK AT THIER HIDDEN BLIND SPOTS!!!!! THATS WHY THEY ARE HIDDEN!!!! The hidden blind spots are 1- anger, 2- pride, 3- deception, 4- envy, 5- avarice, 6- fear, 7- gluttony, 8- lust and 9- sloth as well as other flaws and deficits in charactor. Many enneagram teachers lay them right out for all to see as below... But I have found, a softer more gentle approach is easier to teach and then you can zing them with the scarry mirror! But thats just me! While Know Thyself is an important tool in spiritual growth, as a 4 who moves to 1, I have to be careful not to beat myself up with my flaws. Though to hide these flaws away can also be dangerous, to hide it from any light, any conscouisness can causes unhealthly growth and mutation AND A SWIM UP "DE NILE". 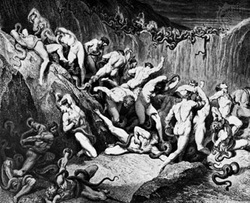 The classic list of 7 deadly sins from the Catholic Church as listed in Dante(1265-1321) from the as The Divine Comedy) mirroring t Dante’s journey through hell --1- anger, 2- pride, , 4- envy, 5- avarice, , 7- gluttony, 8- lust and 9- sloth in search of his true love, Beatrice.
" The Tale of Two Wolves"
Here is the same story, but it is called "Grandfather Tells" which is also known as "The Wolves Within" An old Grandfather said to his grandson, who came to him with anger at a friend who had done him an injustice, "Let me tell you a story. But the other wolf, ah! He is full of anger. The littlest thing will set him into a fit of temper. He fights everyone, all the time, for no reason. He cannot think because his anger and hate are so great. It is helpless anger,for his anger will change nothing. Best to watch both wolves, always knowing where the "hidden blind spot" is but being careful which you FEED!